Odisha can lead a second Green Revolution in the east if it taps the hidden potentials like a boss. The slogan of ‘Make in Odisha’ is being raised, Bhubaneswar is going to be a smart city. But first the state must explore ways of raising its farm productivity. Odisha is one of the rare states that has enjoyed a long period of political stability and continuity in economic policies since March 2000, when Naveen Patnaik took over as chief minister for the first time. The state is also blessed with abundant natural resources, especially minerals, forests and groundwater. Given all this, Odisha should have been one of the richer states of India. But Odisha’s per capita income is the fifth lowest in the country and poverty the sixth highest amongst various states of India. Odisha’s per capita income — Rs 24,928 in fiscal year (FY) 2014 — was about 62 per cent of the all-India average — Rs 39,904 in FY14. Although it is much better in this respect compared to Bihar (Rs 15,506) and Uttar Pradesh (Rs 19,233), Odisha remains way below the top-performing states like Sikkim (Rs 83,527), Maharashtra (Rs 69,097), Haryana (Rs 67,260) and Gujarat (Rs 63,168). One-third of Odisha’s population is poor, which is higher than national average – 22% of the country’s population is below the poverty line. To put things in perspective, let’s compare this to that some of the other states in India. Kerala: 7% of Kerala’s population is below the poverty line. Sikkim and Punjab: 8% of the population in Sikkim and Punjab is below the poverty line. Haryana: 11% of Haryana’s popular is below the poverty line. Note: The figures are from 2011-2012, as per the erstwhile Planning Commission estimates based on the Tendulkar poverty line. In its quest to industrialize fast, Odisha is hosting a mega event, “Make in Odisha Conclave”, at the end of this month. Bhubaneswar, the state’s capital, tops the list of 20 smart cities to be developed under the Union government’s 100 smart cities program. But the case of Dana Majhi, who was forced by poverty to carry his wife’s dead body on his shoulders for 12 km, raises an important question. What is the best and fastest way to eliminate poverty? A research at ICRIER by The Indian Express reveals that higher productivity and income in agriculture may still hold the key for faster poverty alleviation. This is particularly so since 91% of poverty in Odisha is rural, and more than 60% of its workforce is engaged in agriculture. But unfortunately, between 2010-2011 and 2014-2015, Odisha’s agri-GDP recorded an annual average growth of a mere 0.9 per cent. Compare this with a 14.2 per cent agri-GDP growth in Madhya Pradesh and a 7.1 per cent agri-GDP growth in Bihar. Odisha’s productivity with respect to its main crop, rice, is less than two mt/ha (metric tonnes per hectare). Punjab’s rice productivity is four mt/ha, Haryana’s 3.2mt/ha and Andhra Pradesh’s four mt/ha. Low rice productivity in Odisha is surely discomfiting. 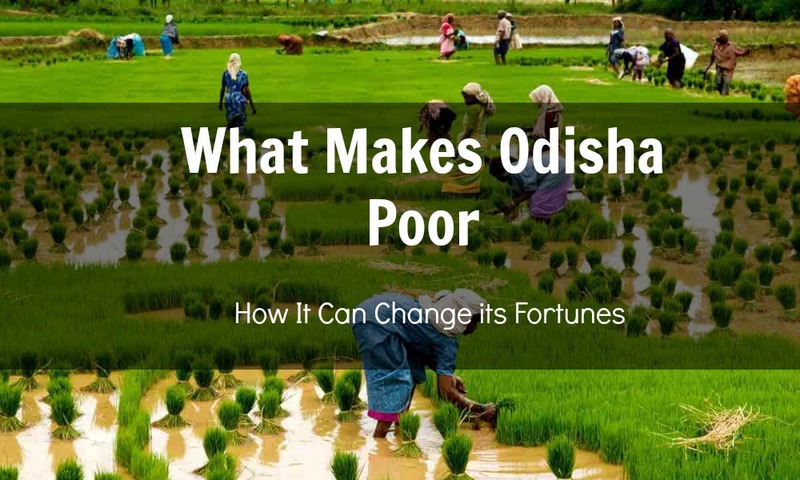 So, how can one turn around Odisha’s agriculture and alleviate rural poverty faster? Here are some suggestions to fix rural poverty in Odisha. First, the state should gain better control over water resources, especially those pertaining to irrigation. About 39 per cent of Odisha’s gross cropped area is irrigated (compared to the all India average of 48 per cent, and above 95 per cent in the Punjab-Haryana belt). Odisha has a large (70 per cent) untapped groundwater potential and about 50 per cent untapped potential from major and medium irrigation schemes. While this is holding back the state’s agri-growth, some strategic interventions can turn things around. 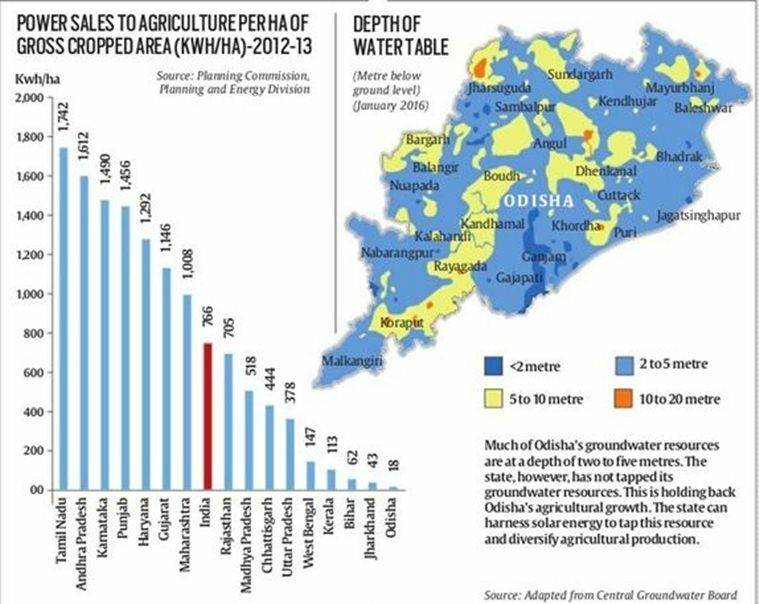 Luckily, much of Odisha’s groundwater reserves are at a depth of just two to five meters (see map below), which can be tapped economically if adequate power supply is provided to the agriculture sector. Unfortunately, Odisha provides only 1.3 per cent of its total power supply to agriculture, which means agriculture gets less than 20kwh/ha. This reflects gross neglect of agriculture. Such a situation typically arises when supplying power to agriculture through grid increases the losses of discoms as power tariffs for agriculture are generally zero or power is provided to agriculture at highly subsidised rates. Diesel is too expensive for farmers. The solution could lie in large scale installation of solar irrigation pumps, which can supply power at Rs 4.5 to Rs 6 /kwh. Odisha receives solar radiation of around 5.5 kwh/sq mtr and 300 days of sunny days. Solar power in rural areas can also help build value chains, including cold storages for high-value agriculture, especially, fruits and vegetable cultivation and milk production — areas where Odisha has done relatively better. Secondly, Odisha must focus on paved roads. Roads provide linkages to output and input markets, increase labor mobility, and give good returns to farmers. As per Odisha’s Economic Survey (2014-15), surfaced roads as a percentage of total road length in Odisha remained in the range of 20-30 per cent, compared to almost 90 per cent in Gujarat, Punjab and Haryana. In fact, almost 46 per cent of villages in Odisha do not have all weather road connectivity. This prevents farmers from getting the best price for their produce and inputs. Thirdly, the state should incentivize diversification of agriculture towards high value products such as livestock and fruits and vegetables. It should promote well- coordinated value chains for such products — the AMUL model in milk production and the Venkateswera/Suguna hatcheries model in poultry are good examples. Just these three interventions, tapping groundwater irrigation through solar power, providing paved roads, and incentivizing diversification toward high-value agriculture, can bring rich dividends and alleviate poverty in Odisha much faster. Incidentally, the research also shows that in Punjab, during the Green Revolution’s heydays (1970-1985), irrigation, roads and procurement system played a pivotal role in propelling agri-growth and reducing poverty. Odisha will be better off if it keeps these lessons in mind. In fact, it can lead a second Green Revolution — this time from the east. I am from Odisha and I can confidently say this is not going to happen till that idiot Naveen Patnaik rules the state. Nice..Govt should take initiative…and people of odisha should work hard.